The Submissions Summary Report summarises the key themes that the Department of Internal Affairs (the Department) has identified from the 235 submissions that the Department received on the Fire Services Review (the review) discussion document that was released on 27 May 2015. This is the Executive summary of the Submission Summary Report, which gives a broad overview of the themes and discussion in the Report. Overall, the submissions demonstrated support for change with over fifty per cent of submissions supporting a change in the way that the fire services operate and are structured. There were three governance and support options in the discussion document: enhanced status quo, coordinated service delivery, and one national fire service. Each option was presented as a separate, fixed package so that it could be compared – but there were many different ways the options could be put together. This was emphasised throughout the discussion document and during our discussions with stakeholders, and is captured in this summary report by focusing on key themes. The report is structured by first providing an overview of the submitters that expressed their opinions in this process. The current state is then explained, to reflect submitters’ views on what is working well with the fire services and what are the current problems and consequences that need to be addressed. 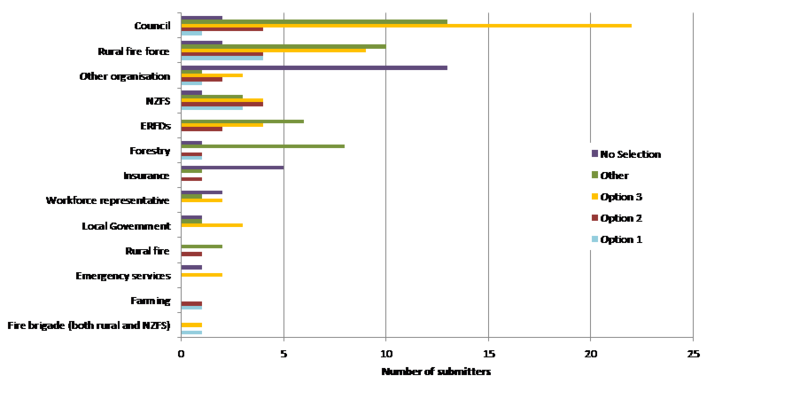 Submitters’ preferences for the governance and support options are presented according to the themes that submitters raised in their submissions. information about practical matters that the funding options need to provide for. Figure 1 below shows the 235 submitters split by submitter type. The types are defined by the industry they are involved with or their organisation group. Individuals are listed as their own submitter type. The ‘other organisations’ included residents associations, a research organisation, museums and electricity associations. The majority of submissions came from individuals with 79 submissions. Most of those individuals identified as firefighters and many had a long history either working or volunteering with the fire services, with current and former Principal Rural Fire Officers, Rural Fire Officers and Chief Fire Officers, forestry sector employees, a former Area Commander and other management in the New Zealand Fire Service (NZFS), a former President of the United Fire Brigades Association (UFBA), and a former National Rural Fire Officer. A number of individuals had worked or volunteered both for NZFS and for rural fire services. Government agencies with an interest in fire services or a role in delivering fire services, such as the Department of Conservation, did not make submissions on the discussion document because they have been involved in the policy development process with the Fire Services Review Team. A list of all government agencies that are involved with the review can be found at Appendix One of the report. The discussion document asked submitters about what is currently working well in the fire services. A wide range of submitters answered this question. The majority of submitters commented on team work as an area that was working well, with 118 submitters. These submitters talked about the strong coordination within the different fire services and between fire services and other emergency services. Submitters also focused on volunteers’ contributions to the fire services. the provision of equipment, training and resources (14 submitters). Even though there are areas that are working well, most submitters (over 180 submitters) agreed that there are problems that need to be addressed. The discussion document set out three core problems: changing expectations, a lack of coordination and variable leadership, and investment that is inconsistent with community needs. The discussion document considered that these problems led to six consequences: health and safety issues for rural fire, volunteer shortages in some parts of the country, challenges to support the workforce, mixed or unclear responsibilities, challenges to be effective and challenges to be efficient. A wide range of submitters responded to the question that asked if submitters agreed with the problems and consequences that the review identified. One hundred submitters agreed that changing expectations was a key problem, with updating the mandate for the fire services to provide non-fire activities as the main issue to be addressed. This was followed closely by a need to better support the workforce, with a particular emphasis on recruiting, retaining and supporting volunteers. A common concern for volunteers included training that is adequate and relevant, without being too academic. Another common concern was the pressure on volunteers’ time. Ninety submitters agreed there were challenges for the fire services to be effective, with many submitters considering this related to the differences between the urban and rural fire services, including the lack of coordination, barriers to coordination and different attitudes and culture. Submitters also considered that a lack of resourcing, the lack of a national reporting system and other systems contributed to challenges to be effective. Eighty-eight submitters also agreed that investment was inconsistent with community needs, especially with an under-investment in rural fire. Eighty-six submitters agreed that there was a lack of coordination and variable leadership. A number of submitters considered that the system worked “despite itself” because of the particular people involved making it work. The structural separation between urban and rural fire was considered by many submitters to be a barrier to better coordination. Submitters were concerned about volunteer shortages, with 41 submitters agreeing that this was an issue. The issues raised included demographic changes such as people commuting during the daytime and an ageing volunteer workforce. Other submitters focused on pressures on volunteers, such as constraints on their time, additional training requirements and attending non-fire incidents. Submitters also agreed there were challenges to be efficient (18 submitters), mixed or unclear responsibilities (16 submitters) and health and safety concerns (13 submitters). A number of submitters made other comments, including general agreement (19 submitters) or disagreement (seven submitters) with the problems set out in the discussion document. Ten submitters also raised the current legislation as a problem. A relatively small number of submitters disagreed that a particular problem was in fact a problem for the fire services, or submitted that it was not a problem that they experienced in their area. For example, while 86 submitters considered that a lack of coordination and/or variable leadership was a problem, 12 submitters considered that it was not. In the discussion document, submitters were asked about their views on the advantages and disadvantages of the governance and support options. This provided us with a wide range of opinions and views about how the options could work, which did not necessarily match submitters’ selection for one of the options. From reading and analysing the submissions, it became clear that there were five key themes. These five themes and an overview of how the Department has interpreted submitters’ comments about those themes are provided below. The themes indicate the areas that need to be focused on when considering any changes to the fire services. Volunteers and how to best support them was the topic most frequently mentioned by submitters. This included comments on how to better support volunteers through improved training and equipment. Submitters also commented on providing management support, and how to ensure the sustainability of volunteering in the fire services by providing opportunities and incentives. Forty submitters made specific suggestions on possible incentives for volunteers, including a rebate on the fire service levy, reimbursement of expenses and remuneration for loss of earnings. Some submitters also considered that employers of volunteers should be able to claim the cost of an employee attending an incident. Submitters also highlighted the risks of the different options for volunteers, with some emphasising the need to preserve volunteers’ independence and to consider the impact of changes such as attending rural fires, non-fire incidents and the integration of the paid and volunteer workforce. Submitters had varying views on which option would provide the best support for volunteers. Many submitters commented on how the fire services could provide more effective service delivery. These comments related to improving the national data, policies, resources and training, and providing greater clarity and flexibility about who is responsible for what, including the delivery of non-fire activities. It also includes comments about powers such as issuing fire permits and offences under the fire services legislation. This theme also discusses rural fire as submitters wanted recognition of the differences between rural fire delivery and urban in a new model. They were concerned that the specialist skills, people and equipment required for rural fire would be lost in a national model. Suggestions to allow for these differences included keeping separate rural and urban arms in a new organisation, maintaining the current ERFD model or ensuring that the specialisation required for rural fire was recognised and provided for. How to improve the efficiency of the fire services is also discussed under this theme, with submitters commenting on the advantages and disadvantages of developing smaller or larger organisations. 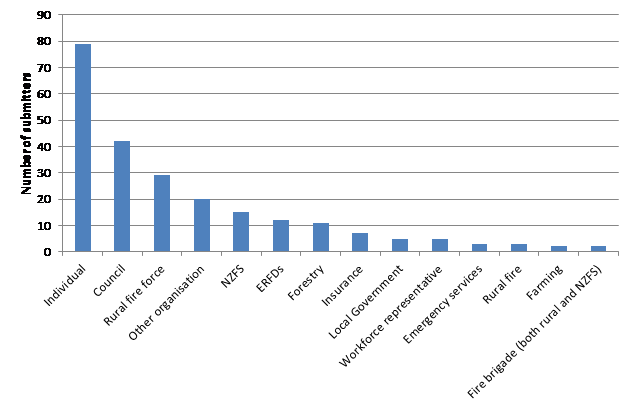 Ensuring that communities remain involved in the operation of the fire services under a new model was the third most common theme among submissions on the governance and support options. These comments focused on keeping local control of fire services and how this could be achieved under the different options. Some submitters considered the fire services moving to a decentralised regional model, for example, having regional governance with national coordination, or continuing the ERFD model (and potentially applying it to urban fire services). Comments about community involvement emphasised the importance of the local identities of brigades and their connection with the community. Some submitters made suggestions about how communities could be involved, including having communities elect a regional or local governance body, having advisory committees or having community boards with input into the national organisation. Transitioning into a new model was a key theme throughout submissions. These comments focused on people’s appetite for change, what a comfortable size of change would be and how to minimise disruption to the fire services. Submitters also discussed the current cultural differences that exist in the fire services - between rural and urban fire services, and between volunteer and paid fire services. They emphasised that these differences needed to be recognised and addressed, particularly if the fire services were to become one national organisation. Submitters made suggestions about how to help with this transition and address these cultural differences, including undertaking further consultation, considering the impact of the change on volunteers, and recognising the rural and local nature of the delivery of the fire services. How funding was allocated and who should fund the fire services were issues raised by many submitters, including discussions about funding for rural fire and who should be involved with this. This section of the report does not consider the source of funding for the Commission as this issue is addressed in the ‘Funding of the Commission’ section on page 65. Option 3, one national fire service, which would create a new national organisation made up of both rural and urban fire, delivering fire services as required in the community. Submitters were able to choose one of those options, or an ‘other’ option, which could include a mix of the options. Although one option was selected by many submitters, this was often conditional support. For example, a submitter might have selected Option 3 but only if there was strong regional involvement or control. 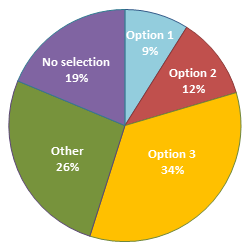 The figures following show all submitters’ option selection (figure 2), all organisations’ option selection (figure 3) and individuals’ option selection (figure 4). suggested a step change through different options, with the goal of moving eventually to Option 3 (six submitters). 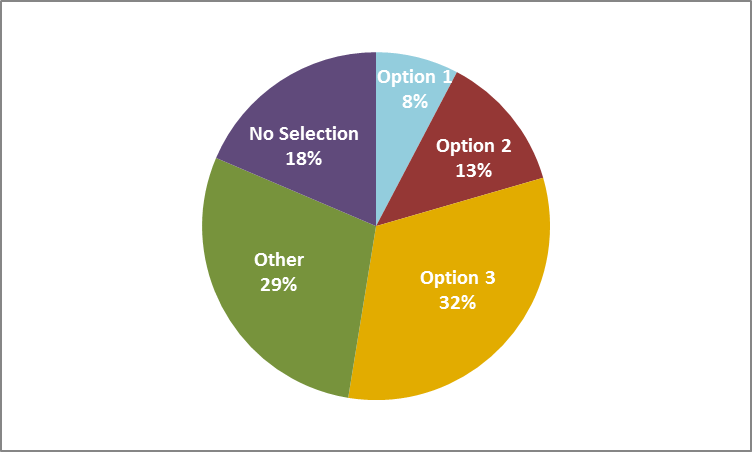 More submitters supported Option 3 (81 submitters) than supported any other single option. Those that selected Option 3 included 21 of the 42 local authorities that made submissions and four of the 11 ERFDs, as well as the ERFD Chairs’ Group. Two of the three emergency services organisations also selected this option. The Professional Firefighters Union and the New Zealand Executive Fire Officers Society also supported Option 3, as did nine of the rural fire forces. The next most supported option was an ‘other’ option with 62 submitters. Fourteen of the local authorities selected this option with five seeking a mix of Options 1 and 2 and five seeking a mix of Options 2 and 3. The six ERFDs who selected ‘other’ did so because they were interested in a bigger Option 1 (one ERFD), a mix of options 2 and 3 (three ERFDs) or they thought that any change should be guided by outcomes or principles such as the involvement of the local community (two ERFDs). Eight of the 11 submitters associated with the forestry sector selected ‘other’. Two were interested in a bigger Option 1, two in a mix of Options 2 and 3, and four focused on the outcomes or principles. Local Government New Zealand (LGNZ) and the UFBA also supported an ‘other’ option, because they thought the option selection should focus on the outcomes or principles. Twenty-seven submitters supported Option 2, with four local authorities, two ERFDs, Federated Farmers of New Zealand (Federated Farmers) and one forestry organisation supporting this option. The main reason for submitters choosing Option 2 was because it delivers the benefit of some integration while retaining the separation of rural and urban fire services. Twenty-one submitters supported Option 1, which included one local authority, one farming organisation and one forestry organisation. Forty-four submitters also made ‘no selection’, in most cases this was because they were only commenting on the funding options. Submitters’ support of the governance and support options based on their organisation is shown in Figure 5 below. Individuals are not included in the graph, to provide a clearer overview of the organisations’ option selection. Amongst the individuals: nine selected Option 1, seven selected Option 2, 31 selected option 3, 17 ‘other’ and 15 made no selection. 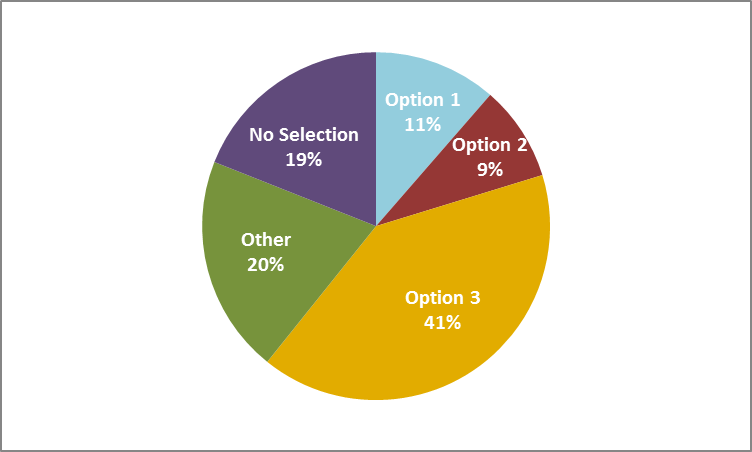 a large change: 109 submitters (57 per cent) – made up of the 81 submitters who selected Option 3 and the 28 submitters who selected ‘other’ options that involved a mix of Options 2 and 3, or an option that stepped through the changes from Option 1 to Option 3. In addition, 19 submitters (10 per cent) selected ‘other’ options that focused on the outcomes or principles sought. The options in these submissions ranged from small to a large change. Funding Option 2: Mixed Funding Model, which included the options to improve the insurance-based levy, proposed removing levy from vehicle insurance to other vehicle contribution methods and proposed a Crown contribution to help fund non-fire responses undertaken by the fire services. Comments on the funding options are arranged into two sections: themes and how the funding options could work in practice. In the themes section, many submitters were interested in the comparative fairness of the options and how the funding options addressed the issue of free riding. Two particular areas of concern were non-insurance and under-insurance (including of government-owned property) and non-insurance of motor vehicles. Funding Option 2 was seen by a number of submitters as providing a wider variety of funding sources, which helped to mitigate free riding. Some submitters were also concerned that the source of funding, being fire insurance, did not reflect the range of activities undertaken by the Commission. Forty-one submitters considered that Funding Option 2 would better reflect the range of activities. Others were concerned about whether the funding would be sustainable and sufficient. Practical matters raised by submitters related primarily to the simplicity and ease of administration of the funding options. The submissions also considered how the options could work in practice. These related to implementing a new insurance levy, how a government contribution could work and how motor vehicle related incidents should be funded. A number of submitters were interested in whether there should be a cap on the Commission’s fire service levy. Most agreed that there should be a cap on residential property, particularly as the cost of providing the service is generally the same at different residential properties. Submitters discussed whether the levy should be calculated on insurance premiums, which could potentially provide for risk-based levying, or on the sum insured, which was seen as more stable, simple and certain. Submissions also discussed whether the levy should be a fixed or variable rate. A variable rate was generally seen as too complex, although submitters stated a potential benefit of a variable rate was that it could reflect risk, the cost of providing services, and the frequency of use. Submissions considered the type of insurance contract that should be subject to the levy – whether it should remain based on fire risk, or should be extended to include material damage contracts. Submissions also looked at whether the levy should remain on all property, or be limited to buildings. There was also some discussion of the current exemptions. Finally, submissions from insurers and brokers provided some detailed submissions on how the administrative aspects of the levy system could be simplified and made fairer. A number of submitters considered the issues around a government contribution, under Funding Option 2. There was some support for a government contribution for incidents where the fire services supported the Police and ambulances. Other submitters were interested in a government contribution to reflect the under-insurance of government property. Submitters also provided various options for funding medical callouts, primarily from the Ministry of Health or ACC. Funding for motor vehicle incidents was also discussed. A levy on annual vehicle licensing was seen by some submitters as capturing more motor vehicles than an insurance-based levy, while being relatively simple to collect. The other main option was road tax revenue, which was again seen as capturing more motor vehicles than an insurance-based levy. There was reasonably strong support for changing the funding of the Commission, with 57 per cent of submitters choosing Funding Option 2 or an ‘other’ Option as their preferred option. A significant feature of submissions was their interest in either rates or general taxation as funding sources, even though the discussion document had rejected these options. 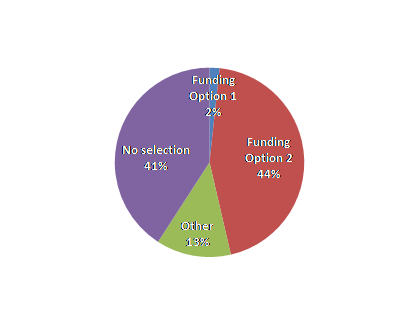 As the chart above shows, more submitters supported Funding Option 2 than any other option, at 44 per cent (105 submitters). It is important to note that 21 of the submitters who selected Funding Option 2 would have preferred the Commission to be funded through other means if those options were available. Of those 21 submitters, 12 would have preferred the Commission was funded by general tax, seven would have selected rates and two submitters would have selected a combination of the two. The next most popular funding option was ‘other’ at 13 per cent (30 submitters). The other funding options that submitters selected included a combination of the funding options from the discussion document (22 submitters), rates (three submitters), general tax (three submitters) or an emergency services levy (two submitters). A large number of submitters did not select or make distinctive comments on the funding options at 41 per cent (95 submitters). These submitters either mainly commented on the governance and support options, or made statements that the funding system should be fair and equitable but did not provide any preference on how this should be achieved. Most of the 105 submitters that supported Funding Option 2 were individuals (37 submitters), followed by local authorities (22 submitters), other organisations (12 submitters) and rural fire forces (nine submitters). Six of the seven insurance organisations that made submissions also supported this option. Five of the 11 forestry organisations that made a submission supported an ‘other’ option. The list of submitters, their organisations and what options they selected is provided in Appendix Two of the report. Percentages relate to those submitters who chose a governance and support option. The submitters who made no selection of a governance and support option have been excluded from this discussion. ‘Free riding’ refers to people who do not insure, or who underinsure, so do not pay a fire service levy, or pay a reduced levy, when they may benefit from fire services.